Alright y'all! We're back for another round of Splurge or Save. This time it's all about the gorgeous baby blue gingham top. Gingham designs have been popping up like daisies in the springtime -- they're everywhere & they're glorious! You can find your gingham shirts, trousers, trenches, & whatever your mind can think of. What is gingham exactly? The definition states that it's a lightweight plain-woven cotton cloth, typically checked in white & a bold color. 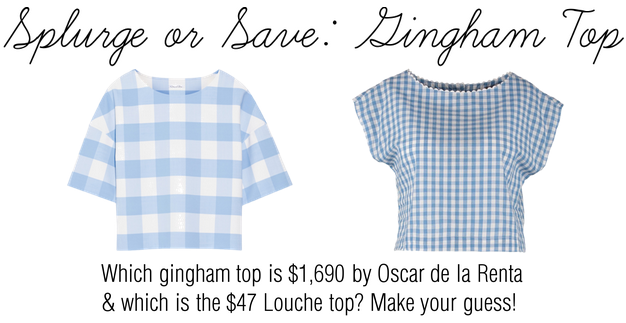 Your sole duty today is to figure out which gingham top is $1,690 by Oscar de la Renta & which is the $47 Louche top? Make your guess now! Scroll down to find out the answer. Did you make up your mind? No peeking! Well, let's see if you were correct. The Oscar de la Renta design can be found on the left; the Louche gingham top is on the right. How did you do? Although these tops are not identical their styles are similar. Oscar de la Renta's is a beautiful powder blue checkered top with a loose A-line shape. The affordable brand Louche has a slightly scalloped round neck with stunning pastel blue gingham design. For the first time in Splurge or Save, I don't prefer one more than the other. They each have their own qualities that draw me to them. I like the large, exaggerated checkered design of Oscar de la Renta; it's chic & eye-catching. On the other hand, Louche has the typical gingham design, small & understated. The slightly scalloped neck is a charming detail. Both are excellent choices. i LOVE them both! and i love light blue right now!!! They are both amazing! Want them both! Of course a $47 price tag is more appealing! Great post. I love the shape! I still prefer the Oscar de la Renta though, as I love big squares, but the other one is much more aforable of course! hehe well this was fun! I actually got it right and chose the top on the left (yay... winner!!) It's crazy to me that some tops can cost that much, all because they have some fancy name sewn inside (I am way too poor to ever afford anything around that price range) but it is nice that there are similar items out there with a nicer price tag! also, I actually think the top on the right looks much nicer! Gingham is so necessary.. Great piece! I admit - I do love the print on the Oscar de la Renta top, but that totally doesn't justify the price difference. Save! I've been obsessed with the gingham print this season! I wouldn't splurge on such a trendy piece. Although gingham is also such a classic print...oh decisions, decisions! Great post! I guessed right, but actually love the top on the right more. Thanks for sharing! Yikes. I may have to splurge on this one. Thanks for sharing and feel free to visit the hottest eyewear blog in the world. I like the shape too. Too bad it's wayyyyyy expensive. I got it right, yay! I think gingham is a gorgeous vintage trend. Lucky for me, I don't need to splurge on anything, because my mum's old closet has tonnes of these ginghams, and in different colours, too! Thx for your sweet comment, Carmen. Sorry there's no chance of seeing me sans sunnies, I suffer from photo-sensitivity, tho. Cute picks - I'm loving the gingham trend right now! Love gingham! I feel like the color of the OdlR one is more wearable, the other one almost borders on costume feeling to me. They're both pretty cute though! HaHa! I thought the splurge was the Louche. I was so wrong. LOL I really love both of them. This was great. They are both so cute, but I definitely prefer the Oscar top! Yayy, my guess is correct lol.. Both of these tops have similarities, but you still can tell which one is which. They're both looking nice and comfy, yet I'll still prefer the one in $47 rather than go for the expensive one hihi.. They're both really nice but honestly,the first one is more gorgeous. I like both these tops, but I don't think either is worth over $1000. I didn't guess it, but unfortunately I like the most expensive one the most! I love them both but I guessed that the left one would be the most expensive! Damn me and my expensive taste! haha! Lovely blog! SO cute! both are lovely!